Grant's army besieged Lee's forces at Petersburg, Virginia, from June, 1864, until April, 1865. At the same time, Sherman's Union troops took the cities of Atlanta, Savannah, and Charleston, as well as Columbia, South Carolina, and Raleigh, North Carolina. In December, 1864, Confederate General John Bell Hood tried to overcome Union forces at Nashville, Tennessee. His army was crushed. Then, on April 1, 1865, Union troops overran Confederates near Petersburg in a battle called Five Forks. This led to the collapse of Lee's defenses. 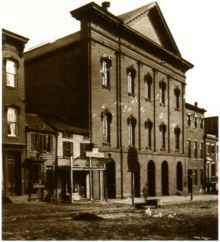 Confederate government officials abandoned nearby Richmond, and Lee's army retreated toward Appomattox Court House, Virginia. Grant's forces surrounded Lee's there, and on April 9, Lee surrendered. Soon afterward, Confederate generals Joseph Johnston and Kirby Smith also surrendered their armies. On June 23, General Stand Watie, commander of Confederate Native American troops, had his soldiers lay down their arms at Doaksville in Indian Territory. This put an informal end to America's deadliest war. 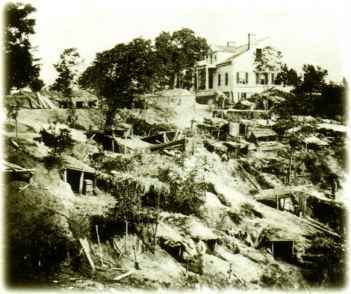 The last months of the war around Petersburg, Virginia, saw Union and Confederate soldiers fighting from trenches. These Union troops are resting behind the trench lines before moving forward to resume fighting. Hundreds of soldiers died around Petersburg from artillery fire, snipers, and mass attacks on each armv's flanks. Four years of bloody civil war came to an end in the tiny parlor of Wilmer McClean's house. 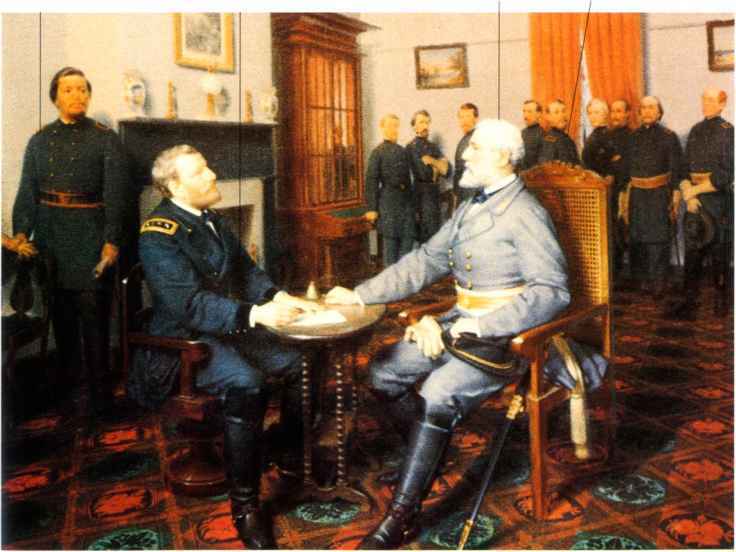 It was there that Lee signed a surrender document prepared by Grant. Today the McClean house is a National Historic Landmark. Officers of Sherman's and Johnston's armies mingle around the North Carolina home of James Bennett, the site of their generals' surrender negotiations. These talks continued for a few days, because Union authorities did not approve of Sherman's first offer to the surrendering Confederates. They believed the terms were too lenient. When President Jefferson Davis, his cabinet, and other government officials fled Richmond, the city's people panicked. Jails and hospitals were broken open, criminals and army deserters began looting, and fires broke out. The capital was already a burning wreck when the black Union troops shown in this newspaper illustration walked into the city. They met with no resistance. After his meeting with Grant, Robert E.
Lee packed his personal belongings and rode away alone to find his family. 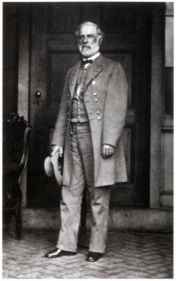 A few days later, he put on his Confederate uniform one last time and posed on the back porch of the house his wife had rented in Richmond. Famous Civil War photographer Mathew Brady, a Northerner, took this photograph. The war ended with entire Southern cities destroyed by fire. Many thousands of people were homeless. Former slaves wandered the countryside looking for refugee relief. Defeated soldiers clogged roads on their long walks home. 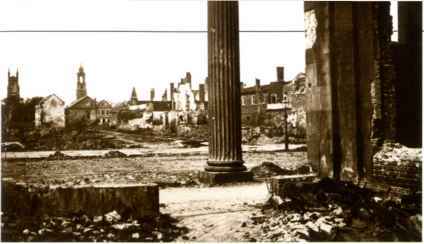 The places where these wandering people rested often looked like this photograph of Columbia, the destroyed capital of South Carolina. There was little shelter and no food to be had. Surrounded by Union troops near the village of Appomattox Court House, General Robert E. Lee sent a note to General Ulysses S. Grant. In it, he asked for surrender terms. 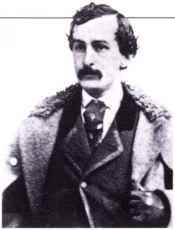 Grant met Lee in a nearby house just outside the hamlet, and there accepted the surrender of the Confederate army. Lee's troops were allowed to find their own way home. In addition, his officers could keep their mounts and sidearms. Some of the Southern veterans walked hundreds of miles to reach their homes and families again.